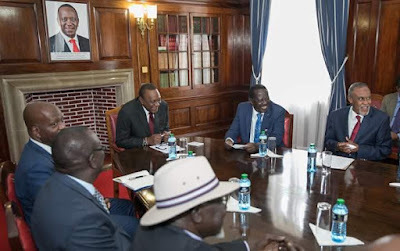 Don't worry on the Increased tax let us fix this country for the benefit of all of us - Raila Odinga - Bana Kenya News, Real African Network Tubanane. ODM leader Raila Odinga has broken his silence over the new VAT that was imposed by the parliament and later the president signed in law. The Financial bill 2018 brought all of the contentious issues that made Kenyans be unsatisfied with it. "Stay with the pain, we will make sure the government stays in toes over the new excise duty. We are just giving them one year to make sure they account on everything after the new Tax." ODM leader Raila Odinga says. The former prime minister has issued a stern warning to the Jubilee that the raised tax to be used in accordance with the intended purpose. He gave out the reasons why he proposed for the new taxes.
" The main reason why I accepted the new tax is just the nature and purpose of the raised funds as explained by the treasury. We need developments and again look at the government is broke due to debts. We warned them but I all went to deaf ears. I resulted to assist them because we are one country. If we auction the country then I will be auctioned too." Raila Odinga said. "We are in Limbo as a country because of the increased tax. It affects everyone including me and my family. We need to be with the government to make sure that we secure our country and make it better otherwise we will all suffer more than any other" he added. Raila Odinga has been accused by Kenyans for not supporting them in their difficult times. Kenyans on Twitter claimed that Odinga has neglected them at their needy period.